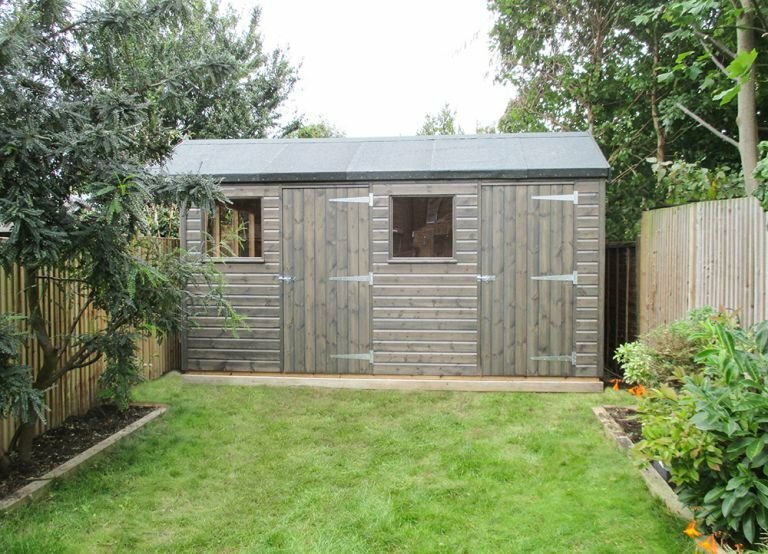 Split into two separate rooms, this 2.4 x 4.2m Superior Shed has been installed in our customer’s garden in Norbiton, Surrey to use for storage and as a workshop. The storage section is 2.4 x 1.2m with no windows, to allow for the full use of the walls for shelves and hooks. 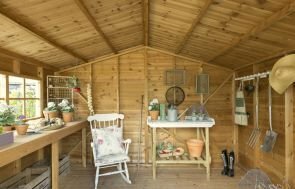 This storage shed is accessible via the right-hand door. 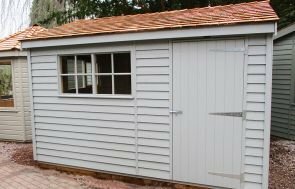 The workshop, however, is 2.4 x 3.0m with five windows, a roof overhang over the left-hand gable, a workbench, and it is accessible via the left-hand door. The workbench has been fitted along the left-hand gable wall, under a row of three windows to light up their workspace. Our workbenches are made from oak-faced plywood to allow for a solid, sturdy finish: they are 900mm tall, and 600mm deep. For the outside, the customer chose a neutral colour scheme, with our heavy duty, heat-bonded felt on the roof, and the paint system they chose is our Sikkens stain in Grey, which offers a translucent coverage that allows the grain of wood to shine through for a natural look. 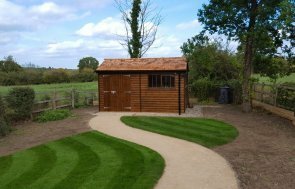 For more information on our range of Garden Sheds, please contact us online or create your own bespoke garden building using our online price builder. Alternatively, come and see us at our Sunningdale Show Centre to speak to our helpful team and look around the wide range of buildings we have on display.